Watercolor is now my media, after many years as a potter. Since this transition, I’ve studied watercolor with Dorothy Voorhees and taken many workshops sponsored by the New Mexico Watercolor Society. At the University of New Mexico, I concentrated on drawing and painting. Before that I took classes toward an art degree wherever my husbands military career took us. All the paintings start anywhere from a few lines to an extensive line drawing. The drawing can be from my photograph, a still life, or a landscape. Using color to develop shapes and volume is exciting. Mostly, I work wet onto dry paper. Skies, flower petals, cloth, something, could be done wet into wet. I think all of them are tranquil and speak of happy times. My watercolors have been accepted into national, international, and local juried shows. Several awards have been won. 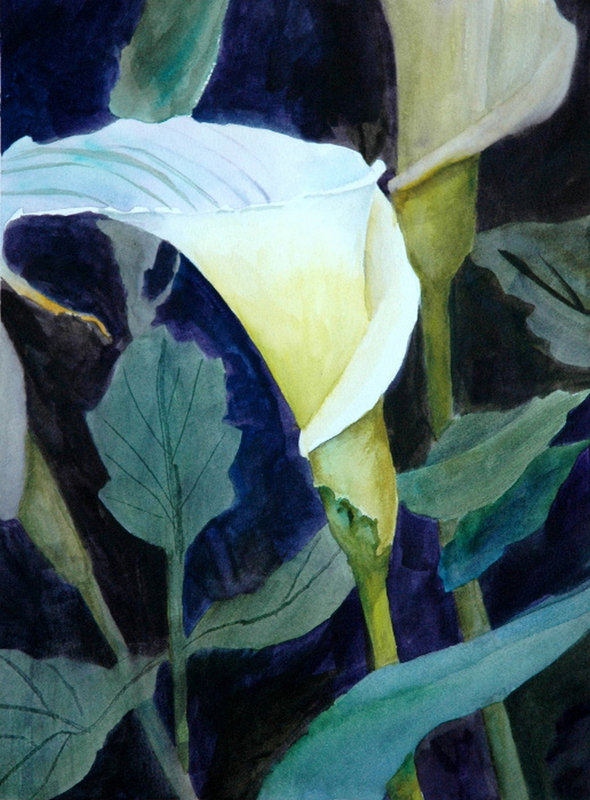 Including Best of Show at the New Mexico Watercolor Society’s Spring show in 2008. Photographs of paintings were in the Winter, 1997 issue of Watercolor magazine and in the Summer 2000 issue of the University of New Mexico continuing education catalog. An article with photos of paintings was in the Albuquerque Journal, West Side edition in 2006. The paintings are shown at Yucca Gallery in Albuquerque, NM. They are also shown at several local juried arts and crafts fairs a year. I’m a Signature member of the New Mexico Watercolor Society.